Some portrait photographers try and make people look beautiful, others try and capture character. They are two distinct approaches that require different approaches and mindsets. If you haven’t come across this idea before you may be wondering what separates character portraits from beauty style portraiture. So let’s try a definition. 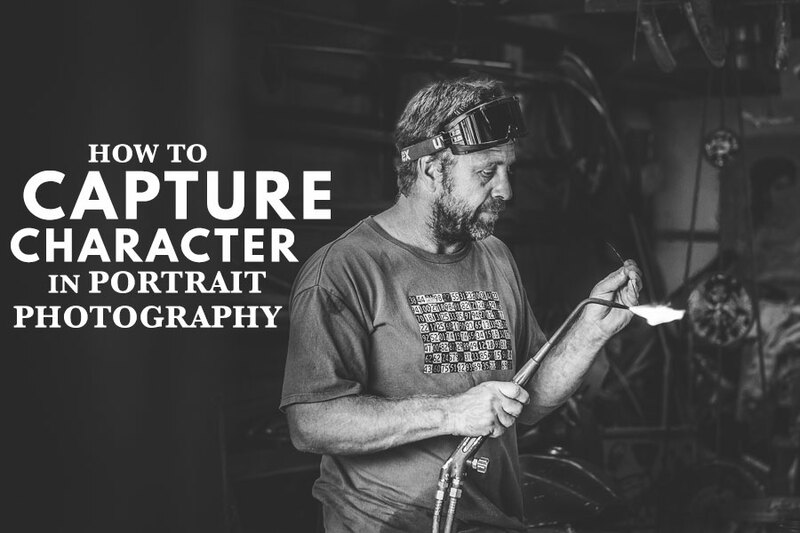 What is character portrait photography? This type of portrait photography is about capturing personality and individuality. It’s also about creating compelling portraits of people who lead interesting lives. This style of portrait photography opens up your range of models beyond people that are considered conventionally beautiful. It’s a more simplistic, honest approach that often creates deeper, more meaningful portraits. The techniques and principles behind it are simple but may take years to master. So, if the goal of a character portrait is to capture the personality of an interesting person, what’s the best way to go about that? Let’s look at some techniques you can use. One of the nice things about character portraits is that it opens up the possibility of photographing all sorts of interesting people. The challenge is finding them. Perhaps you can start with people you know who do interesting things. For example, the model in this portrait is a circus performer that I met through a mutual friend. If you don’t know anybody who is an interesting character, then consider setting yourself a project and making contact with people who may make interesting subjects. Let’s say you decided to make portrait of circus performers. You could get in contact with local circus groups and ask if any members would be interested in taking part. Choice of clothing can say a lot about an individual, particularly if they have a quirky fashion sense. This is the opposite approach to fashion, where the model often wears clothes that don’t belong to them. For character portraits ask the model to bring along clothes and props that are relevant to their personality. 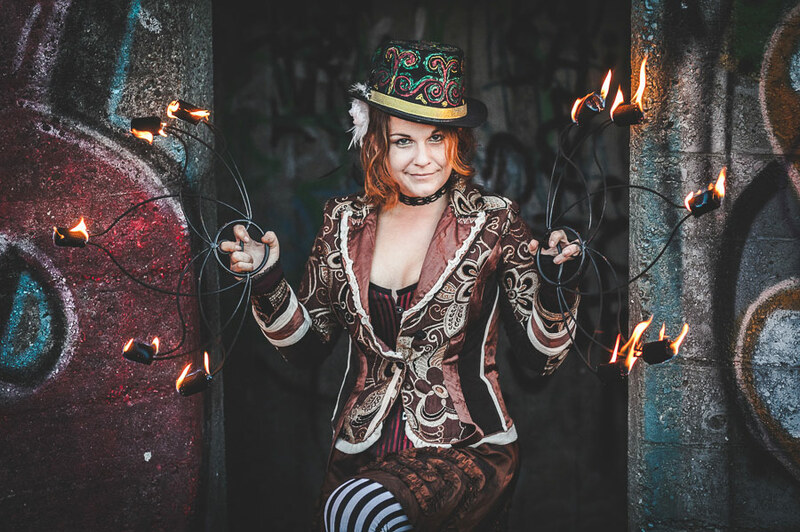 The model in the portrait below is a circus performer. She wore the costume she uses while performing and she bought along the hoops she uses for her performance. 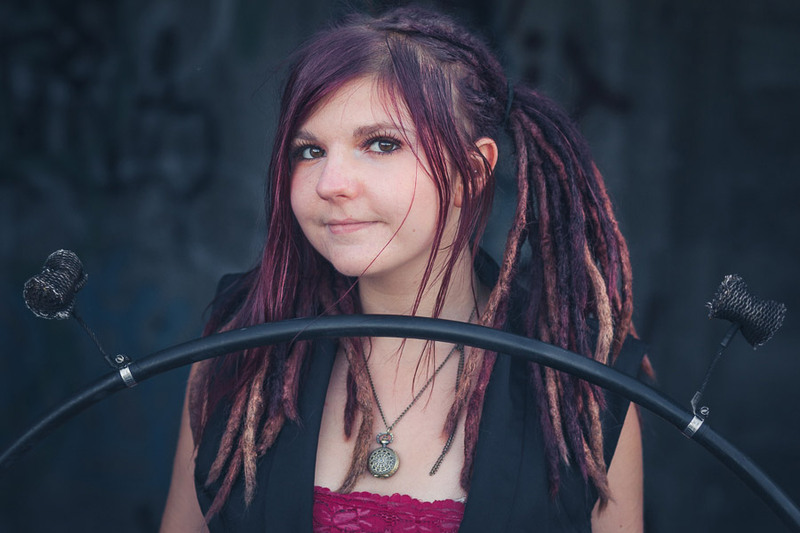 We included the hoop in some of the portraits to add interest and tell a story. When capturing somebody’s character look for links between your model and the environment. Sometimes, as in the portraits of circus performers above, it’s interesting to place people in a new but appropriate environment. But other times the environment may tell an important part of the story about your model’s character. For example, maybe their home or garden are decorated in a way that reflects their character. Or perhaps they have an interesting hobby or profession. 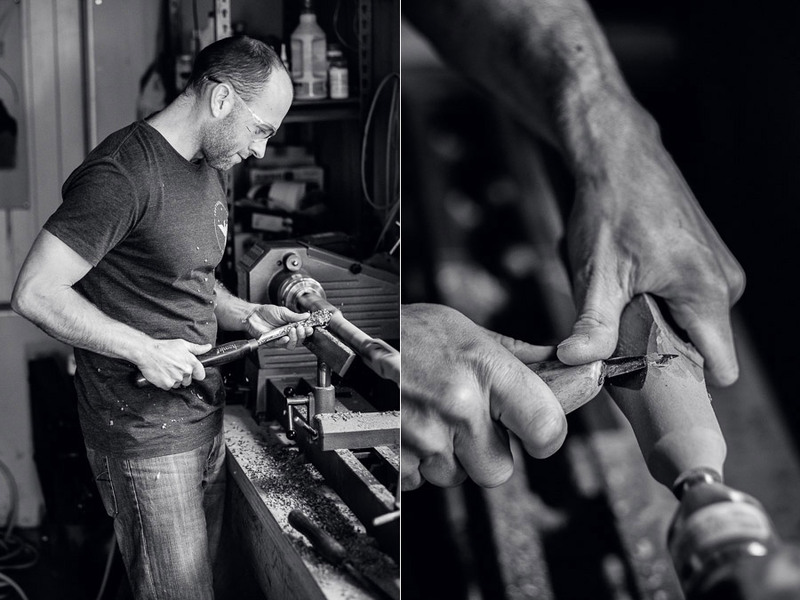 The man in the portraits below makes wooden flutes, so it made sense to photograph him in his workshop. 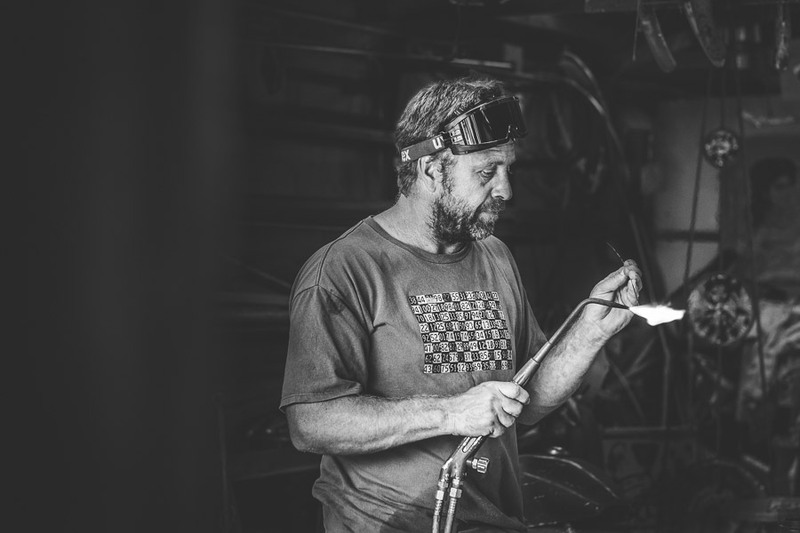 I learned some interesting things about the process of flute making, and created a series of portraits that show him at work. This documentary style approach to portraiture can lead to some interesting results. This applies to all types of portraiture but even more so when trying to capture their character. This idea goes beyond focusing your lens on your model’s eyes and making sure they are well lit and have a catchlight. Eyes are important because they tell you a lot about a person. They convey emotion, vitality, and life. The saying, “The eyes are the windows of the soul” has a lot of truth to it. Older people have wrinkles around their eyes that speak of experiences lived and wisdom gained. For example, in this portrait the strong eye contact makes a powerful connection between the viewer and the model. Prime lenses are the secret weapon of the portrait photographer. Part of that is because of the practical advantages. We all know you can select a wide aperture to blur the background to create portraits with bokeh. But you can also set the aperture to f2.8 or f4 knowing the results will be sharp (compared to the softer performance expected from zoom lenses at those apertures). Being restricted to a single focal length means you have to get creative with your compositions. You can create variety by changing the distance between you and your model, and by utilizing different points of view. But most of all, the minimal approach to gear enforced by prime lenses lends itself to a more honest approach to portraiture. I often take just one camera, one short telephoto lens, and no lights to a portrait shoot. I prefer to rely on natural light. Eliminating distractions helps me concentrate on the next step – making a genuine and meaningful connection with the model. I used an 85mm prime lens set to f2.8 to create this portrait. The wide aperture blurred the background, making the model the center of attention. The success of the shoot depends on the relationship you create with your model. You might only have a short time to do this. I’ve turned up for shoots with people who I’ve never met before, having communicated only by email or text message. It helps that I’m a naturally curious person and enjoy learning about other people and their lives. Part of building rapport is getting the model genuinely interested in the photo shoot. If it is part of an ongoing project let the model know so they can take pride in being part of it. Take a genuine interest in your model and what it is they do that made you want to make a character portrait of them in the first place. Remember that the conversation and the shoot is about your model, not about you. For example, I once made a series of images of an artist called Chris Meek at work in his studio (the portrait below is one of them). We spent a few hours talking about art and life as well as his working process. It was a good afternoon and an interesting discussion that we both enjoyed. 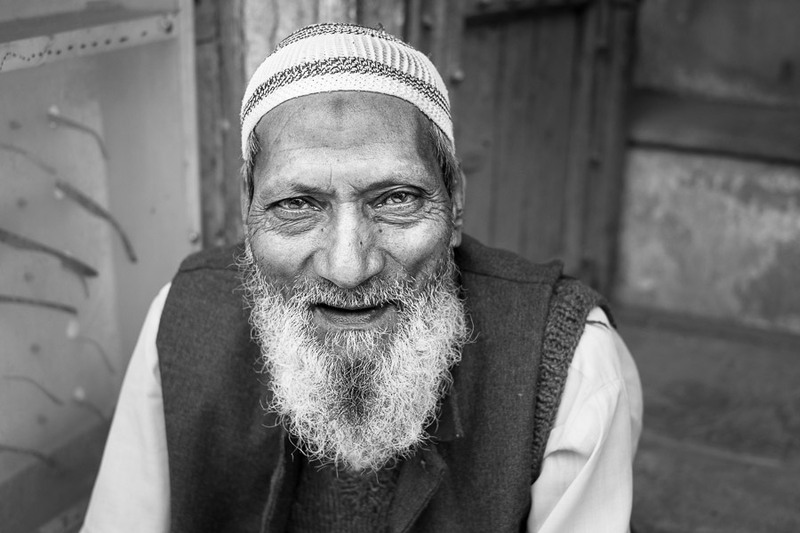 You can create beautiful portraits that capture character while traveling. It helps if you are in a place that has lots of interesting people, and if you speak the local language so you can communicate with people. Pro photographers often work with fixers to help them both meet interesting people and overcome language differences. This is something you should consider if you are serious about creating great character portraits while traveling. 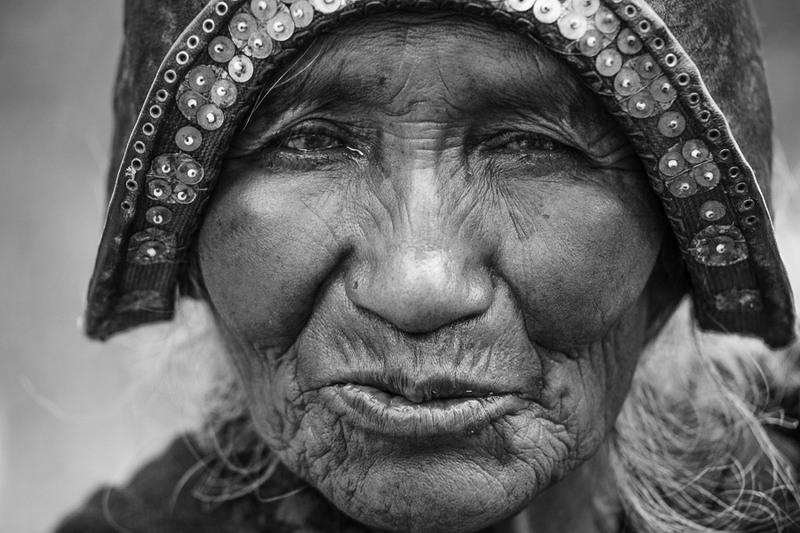 I made this character portrait of an elderly lady in Bolivia. Her eyes and the wrinkles around them convey lots about her life. Even the hat tells a story – it’s style is modeled on the helmets worn by Spanish soldiers when they first conquered the region. Think about your developing style. For example, a portrait that expresses character probably needs far less retouching than a portrait that is trying to make the model look as physically beautiful as possible. A light touch is often best. 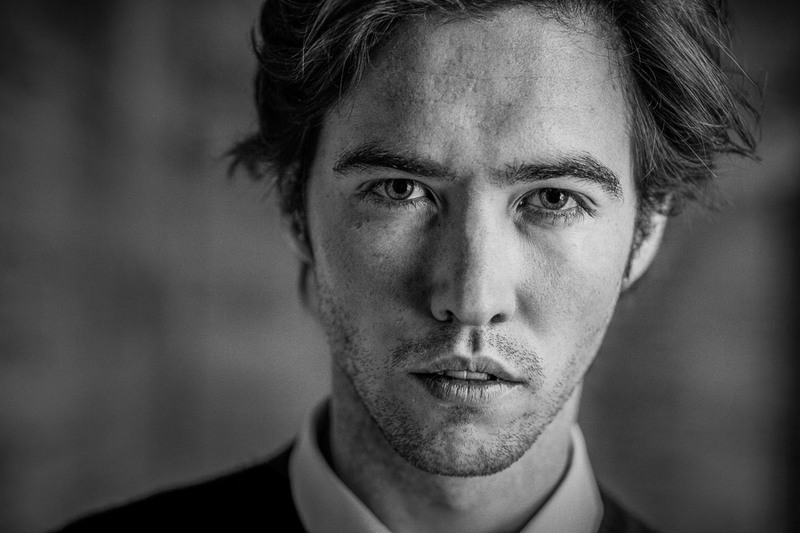 Consider converting your best portraits to black and white. There is something timeless and special about a good black and white portrait that’s ideal for expressing character and emotion. In black and white there’s also more room to experiment with adding contrast and clarity to make the portrait more dramatic, especially with portraits of men. For example, in this portrait I used clarity to bring out the textures in the man’s skin, beard and hat. Capturing character, rather than beauty poses a challenge to the creative photographer, but the results are often more satisfying. That’s because an interest in capturing character marks an evolution in a photographer’s thinking. It’s part of a shift from photographing the superficial to looking for deeper themes and human connections. It’s also a great way to meet interesting people! 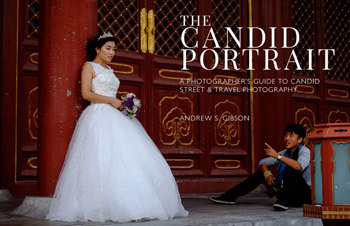 Learn how to take beautiful street and travel portraits with our popular ebook The Candid Portrait. 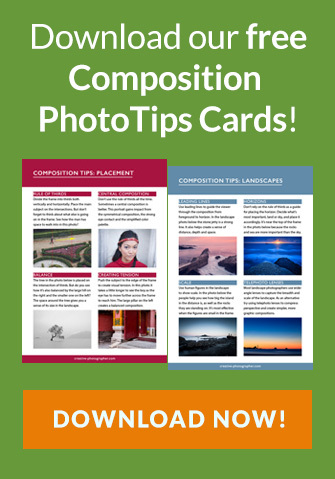 The ebook has 20 easy to digest lessons, two case studies and hundreds of beautiful photos. 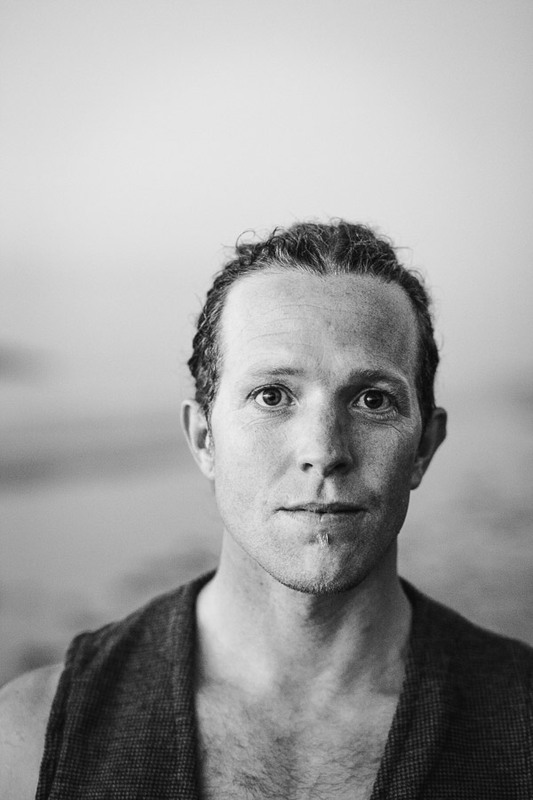 Andrew S. Gibson is a writer, publisher, traveler, workshop leader and photographer based in the UK. He started writing about photography while traveling in Bolivia, and has been published in many prestigious photography magazines including EOS magazine, where he worked as a Writer and Technical Editor for two years. He is inspired by meeting new people, seeing new places and having new experiences. Check out his photography ebooks here. Thanks Dugal, glad you liked it. for, umbrellas , strobes etc. Thanks. Something I want to do with my family, one by one. Sounds like an interesting project, good luck! Very good article on capturing the real person for a timeless image. This is how you make portraits a work of art. 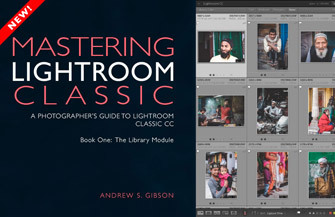 Buy our newest ebook Mastering Lightroom Classic: The Library Module now! © Copyright The Creative Photographer Ltd.